The narrow gauge (1' 10¾") Holy War was delivered new to the Dinorwic Quarry, Llanberis, in May 1902. The Dinorwic Quarry did not name the locomotive at first, which was for sometime known simply as No. 3, carrying a brass number plate to that effect. Holy War is a narrow gauge four-wheel locomotive with a wheelbase of only 39". This allowed her to negotiate the tight curves of twenty feet radius found among the gallery lines on the quarry side. There was initially no cab, only an apron approximately at waist height. A cab and tall chimney would have not been possible, as it would have prevented the locomotive operating in the tunnels and galleries of the quarry. No. 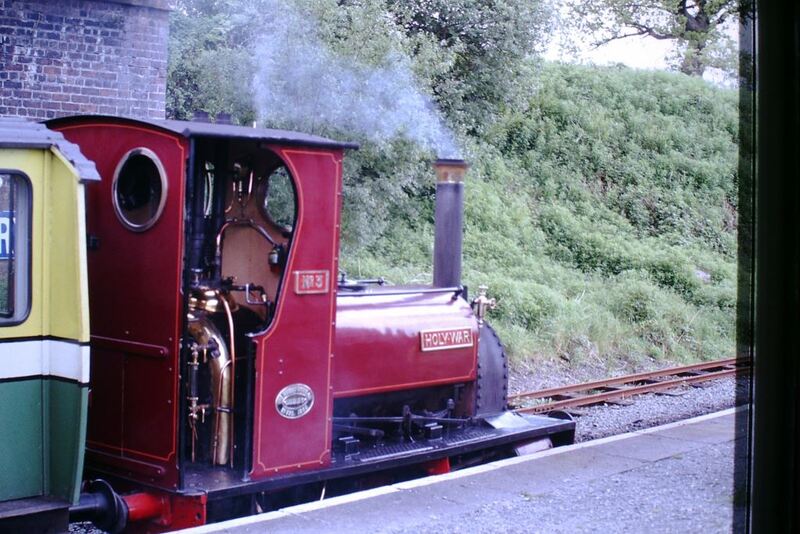 3 carried a crimson lake livery throughout her life at Dinorwic. No. 3 spent most of her career pushing or pulling trains of slate or waste amongst the mountainside galleries, and kept in a small shed at night. Occasionally it would be necessary to partially dismantle the locomotive and lower her carefully down a series of step inclines, normally used for slate wagons, to the quarry floor. She could then be taken to the quarries workshops for overhaul. Occasionally, instead of shunting slate trucks, she would supply steam from her boiler to operate rock drills. In 1908 she was named after the racehorse Holy War, and the No.3 plate was removed. In the years to 1960 Holy War occupied Lernion Shed, the highest locomotive shed in the British Isles at an altitude of 1860ft above sea level. In 1961 a rock fall in the Lernion Gallery marooned Holy War as she could not access one of the inclines to transfer her elsewhere in the quarry. An aerial ropeway was erected to another gallery, and various parts of the locomotive stripped down. These parts, the boiler and the chassis were separately winched across on the ropeway, and then the locomotive reassembled, and work carried on as previously. Now based at Penrhydd Bach, a mere 1270ft above sea level. The quarry however was in decline, as roofing tile was displacing traditional slate as a building material. Modernisation of the quarry lead to the introduction of diesel lorries and quarry machinery. By May 1967 Holy War was the last Welsh slate quarry steam locomotive at work, her sister locomotive Dolbadarn being out of service. November 1967 Holy War ended her working life, simultaneously ending 120 years of quarry steam. On 26 April 1968 a Quainton Railway Society member inspected both Holy War and Dolbadarn at Dinorwic. The later was something of a hybrid, as although it had been built in 1922 with a cab and domed boiler, it had later been altered to take an earlier domeless boiler and the cab top been discarded. Holy War was still more or less as built, and was in marginally better mechanical condition. A price was agreed for Holy War, to include a boiler retube, hydraulic and steam tests. This work was delayed by the complete closure of the quarry in 1969. On completion of the work she moved to Quainton on 20th March 1970. An ex-British Railways BD container was purchased and located in Quainton's Down Yard to provide cover, and a short length of track laid in front of the container. Three days after arrival at Quainton Holy War was in steam; however the short demonstration track was woefully short, and was eventually lengthened to 150ft. Although the Quarry had retubed the boiler, it was soon clear that little else had been touched. On removing the fittings during autumn 1970 the water gauges virtually disintegrated. New fittings and washout plugs were obtained over the winter, and maintenance ensured by the following season Holy War was in good fettle. She was steamed at Quainton irregularly until 1973, but a combination of other commitments by the owner and Quainton site developments, meant a new home was sought. So on the 13th December 1975 Holy War returned to her native Wales at the Bala Lake Railway. Holy War was transported back to Wales on the back of a local coal lorry, and she then entered the Bala Lake Railway's workshops. A new cab was designed and built by apprentices at the Brymbo Steelworks, near Wrexham. New No. 3 plates were also made for Holy War at the steelworks. At Easter 1979 Holy War entered service and started her new life at the Bala Lake Railway hauling passenger trains up and down along the shorelines of Wales' largest natural lake. In September 1989 Holy War was brought by the Bala Lake Railway from its private owner, and in 1995 she was repainted into a dark blue and black livery. This ended the crimson lake colour worn since first entering service at Dinorwic. The locomotive had a reputation for being rather rough in operation during her first ten years of operation. In addition, her reversing level did not like going into reverse. In 1989 the reason for this fault was discovered, Holy War had been running with an expansion link on one side from another Hunslet quarry locomotive, Lady Madcap, which was not of the same Hunslet Alice Class. The link on the other side was from sister engine Covertcoat. The quarry fitters had obviously not being too particular where bits came from when reassembling locomotives. With this fault rectified, Holy War was much improved, and is now a very sprightly old lady. 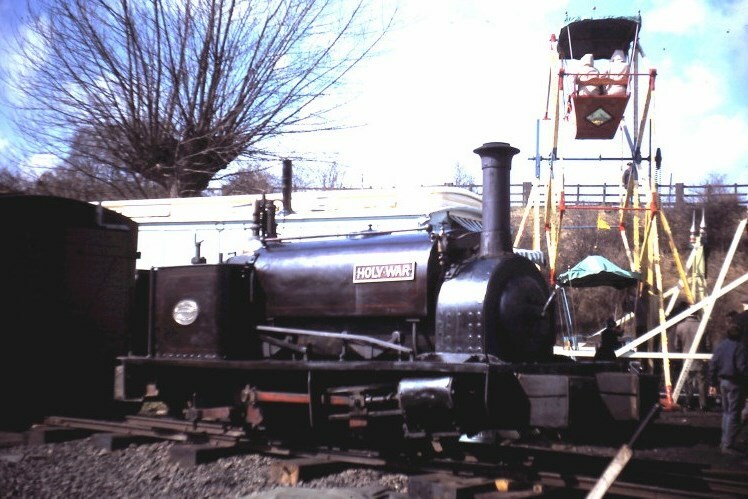 In June 2018 Holy War is took part in the Ffestiniog Railway's Hunslett 125 event, celebrating 125 years of the Ffestiniog's Hunslet locomotives Linda and Blanche. Holy War was withdrawn for its 10 year overhaul at the end of the 2018 Auguest Bank Holiday, it is hoped that she will return to operation in 2019. Tractive Effort :- 2, 940lbs Boiler Pressure :- 160 psi Cylinder Dimensions :- 7" x 10"
Weight :- 6t 14c Driving Wheel Dia. :- 1' 8"